WASHINGTON, DC -- The White House has boosted aid for Ukrainian forces battling Russian-backed separatists but limits training to mainly defensive tactics, triggering criticism the policy is too cautious to blunt President Vladimir Putin's aggressive moves in the region. 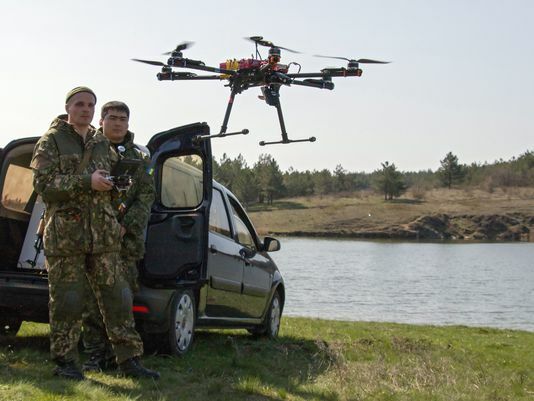 Ukrainian servicemembers practice with a drone during their training near Mariupol, Ukraine. The United States recently turned down Ukraine's request for sniper training for its armed forces because that is considered an offensive skill. The U.S. policy is aimed at teaching defensive skills in order to avoid escalating the conflict. U.S. officials said the distinction between defensive and offensive tactics makes little difference, since the training is focused on building basic soldier skills, which are similar for offensive and defensive operations. As a result, U.S. trainers can teach nearly all the skills needed for small and mid-size combat units despite the focus on defensive operations, commanders say. Skills such as patrolling, for example, are used defensively and offensively. “At the company and maybe even at the battalion level, there’s not really a big distinction between offensive and defensive things,” said Lt. Gen. Ben Hodges, commander of U.S. Army Europe. "What we're trying to do is make sure the Ukrainians at the tactical level are as capable as they can be." Some critics worry that the policy reflects an approach that won't work against Putin's expansionist policies. Rep. Duncan Hunter, R-Calif., and other Republican lawmakers have criticized the Obama administration for limiting aid to Ukraine’s military to “non-lethal” supplies, such as medical equipment, communications gear and radar. But the training has received less scrutiny. The United States has several hundred military trainers in Ukraine. U.S. training efforts began with Ukraine's border forces and national guard, which are responsible for internal security, but recently expanded to Ukraine's conventional forces. “If you’re there, why not train them in the way Ukrainians need to be trained to counteract the Russian offensive,” said Hunter, a member of the House Armed Services Committee who recently visited Ukraine. Such training limitations are not new. Many European countries in the U.S.-led coalition in Afghanistan, for example, had limits on missions they could perform. During the war there, the U.S. military urged its European allies to lift the restrictions, called national caveats. In Ukraine, the situation is reversed. “There are some specific offensive tasks that we just don’t do,” said Col. Nick Ducich, commander of the multinational training group in Ukraine. He said U.S. trainers are not teaching Ukrainian troops how to establish an ambush, which is considered an exclusively offensive skill, in addition to avoiding sniper training. Canada and Lithuania, which also train Ukrainian forces, do not have similar restrictions. The Ukrainians face a formidable foe in the separatists in the eastern part of the country. Russia backs separatists with ammunition, weapons and advisers. Russia also has massed forces at the border at times and provided deadly fire support to the separatists, using drones as spotters for its artillery. Michael Carpenter, a deputy assistant Defense secretary, said the U.S. has to walk a line, helping Ukraine without provoking a Russian response. “The goal has been to help the Ukrainians be more effective in defending their territory without escalating the conflict,” Carpenter said. The United States is providing Ukraine’s military force with about $600 million in training and equipment. The equipment includes counter-artillery radar, night-vision goggles and other sophisticated hardware. “There is no other country that is doing even close to what we're doing,” Carpenter said. In my humble opinion, suspension of trainings will not amend the situation or prevent Russia from invading Ukrainian land, indeed, Ukrainian army needs to develop defensive skills in order to avoid escalating the conflict. I mean that it is better to proceed with trainings because if Ukranians don't we will definitely observe escalation of the conflict. Expert in foreign affairs at thesis writing service, Emily Grey.